From November 9th through 11th, 2018 the international group Scientists for Palestine and many other members of the international scientific community, will gather at Columbia University, New York, NY, USA for a weekend-long meeting involving multiple plenary and parallel sessions. The event is co-sponsored by the Center for Palestine Studies at Columbia University , Columbia Student for Justice in Palestine , Science for the People and Within Our Lifetime - United for Palestine . This will be Scientists for Palestine's second international gathering, after a similar initiative hosted earlier this year at the University of Cambridge, UK . The goal of the workshop is to reaffirm the vision of Scientists for Palestine and establish new and ambitious objectives for scientific collaboration between the Palestinian and the international community, transcending the limitations caused by 50 years of ongoing occupation. The topics that will be discussed will vary widely, ranging from strategy sessions on current status of science in Palestine, to educational discussions on the challenges of doing science under the occupation with the goal of developing concrete opportunities for international scientists to get involved, to scientific presentations from many Palestinian and International young scientists. Scientists for Palestine needs your support! Science has a strong tradition in Palestine. The bi-annual "Palestinian Conference on Modern Trends in Mathematics and Physics", organized by Palestinian academics since 2008, is just one of the many scientific events organized in Palestine. However, higher education and research in Palestine faces many challenges, including some common to many countries, such as lack of funding and heavy teaching loads for professors, as well as unique challenges from the ongoing occupation of the West Bank and Gaza, including restrictions on mobility of students and academics, international isolation, raids and forced closures of Palestinian universities and other scientific institutions, and indictment or imprisonment without trial of individual academics . Nevertheless, interest in physics education and research in Palestine continues to grow rapidly not only within Palestine but also throughout the international scientific community. In December 2015, Palestine signed an International Cooperation Agreement with CERN, signaling Palestine's increasing involvement in cutting-edge scientific research at one of the best laboratories in the world. Very recently 15 among the most famous physicists in the world, including a Nobel laureate and a Fields medalist, signed a letter condmening the use of science to normalize the military occupation of the West Bank . 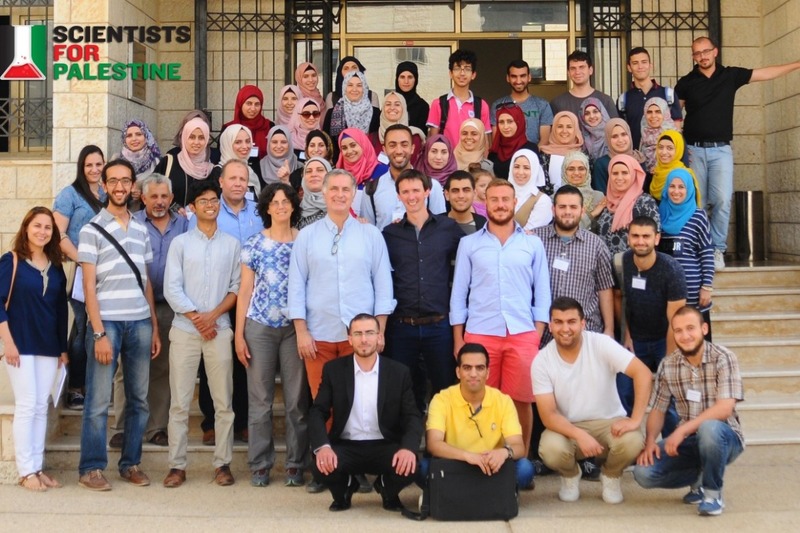 To help meet the rapidly increasing demand for high-level scientific education and collaboration in Palestine, physicists from around the world created Scientists for Palestine , an international group whose goals are to promote and support science in Palestine and to help integrate Palestine into the international scientific community. Among the groups' initiatives is the establishment of the Palestinian Advanced Physics School (PAPS) as a regular event (see here , here and here ), and plans for many further schools, conferences, workshops, and other scientific activities in Palestine which will be discussed at the meeting in November. - $ 3400 will go towards reimbursing visa and travel expenses for Palestinian scientists. - $ 1000 will go towards meals during the event and one social dinner. - $ 600 will go towards advertisment and extra expenses. No donation is too small, and all contributions are greatly appreciated! Thank you for supporting the development of science in Palestine! International Meeting Facebook event .